High school student Sofi Cruz Turner's random act of kindness is going viral. Using money earned from her first job, the teen from Conway, South Carolina, brought one of her classmates to tears with an amazing gift. Sofi says her friend Jahiem "has always been that one student where he does all of his work when due, never misses school, always helping the teacher out with stuff in class, and always being a happy human being." Jahiem had hinted that he needed new shoes and Sofi said she had been wanting to get him something special for a while. So one day, Sofi pulled her newly earned money together and bought a pair of sneakers for her deserving classmate. She surprised Jahiem in class one day, approaching his desk slowly with a backpack. "I've known you for a very long time -- since third grade. And you are very special to me," Sofi told Jahiem. "You are a very good friend to me. And, since I got a job, I've been thinking about getting something special for somebody, and this is for you," she said, handing him the backpack. Jahiem opened the bag and found a shoe box with brand new sneakers inside. 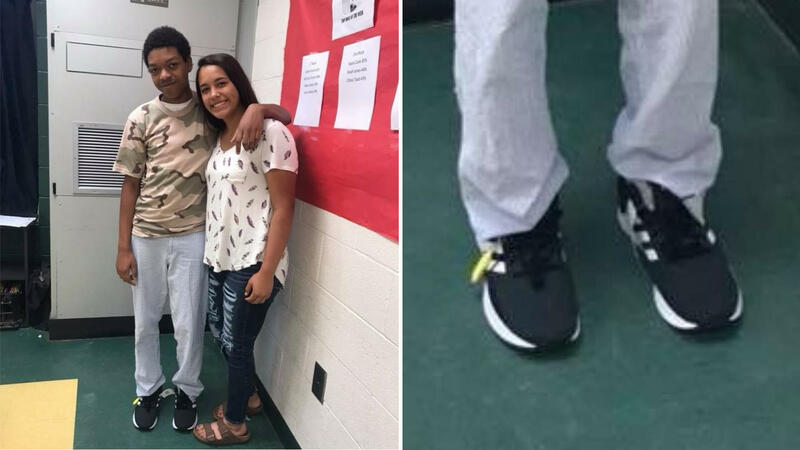 She also gave him a pair of socks to go with his new kicks. "Seeing him crying was very emotional," Sofi wrote in a Facebook post that has since been shared 1,800 times. "I am so thankful to know that giving Jahiem those shoes made him so happy and allowing me to realize that giving someone something so special can be life-changing."